Over the past three decades DNA has emerged as an exceptional molecular building block for nanoconstruction due to its predictable conformation and programmable base-pairing interactions. DNA nanotechnology is the design and manufacture of artificial nucleic acid structures for technological uses. In this field, nucleic acids are used as engineering materials for nanotechnology rather than as the carriers of genetic information in living cells. Researchers in the field have created static structures such as two- and three-dimensional crystal lattices, nanotubes, polyhedra, and arbitrary shapes, as well as functional devices such as molecular machines and DNA computers. The field is beginning to be used as a tool in crystallography and spectroscopy for protein structure determination due to it’s precise nature. Potential applications in molecular scale electronics and nanomedicine are also being investigated wiht the hope that point-of-care diagnostics will be greatly innovated globally. Now, an international team of researchers have designed and synthetized a DNA nanobot whose customized modifications enable it to recognize a specific target antibody. The team state that their novel approach promises to support the development of rapid, low-cost antibody detection at the point-of-care, eliminating the treatment initiation delays and increasing healthcare costs associated with current techniques. The study is published in the journal Angewandte Chemie. Previous studies show that nanomaterials can be utilized in various aspects of the detection system including capture probes, reporting molecules, electrode fabrication and electrode coatings. DNA sensors detect pathogenic and genetic diseases by binding to target DNA strands that are related to the disease and giving a signal that shows how much of the DNA is present. Recent developments in the technology make use of gold nanoparticles functionalised with primer strands that bind to the DNA of interest. When the primers link to the targets, changes in the nanoparticles’ UV-visible absorbance provide a signal. Sensors employing gold nanoparticles randomly functionalised with single-stranded primer DNA can lead to primer strand cross-binding, resulting in agglomeration. This can entrap the nanoparticles and reduce the number of primer strands available for binding to the target DNA, leading to inaccurate readings. In the current study the system is based on a conformation-switching stem–loop DNA scaffold that presents a small-molecule, polypeptide, or nucleic-acid recognition element on each of its two stem strands. Results show that the binding of the antibody to the DNA nanobot causes a structural change, which generates a light signal. The team stress that the sensor does not need to be chemically activated and is rapid, acting within five minutes, enabling the targeted antibodies to be easily detected, even in complex clinical samples such as blood serum. Data findings show that this DNA nanomachine can be custom-modified so that it can detect a huge range of antibodies, meaning it is adaptable for many different diseases. Results show that modular platform provides significant advantages over existing methods for the detection of antibodies. The lab observed that it is rapid, does not require reagent chemicals, and may prove to be useful in a range of different applications such as point-of-care diagnostics and bioimaging. The team state that another nice feature of our this platform is its low-cost with the materials needed for one assay costing about 15 cents. They go on to add that this makes their approach very competitive in comparison with other quantitative approaches. The team surmise that their new research may revolutionize the slow, cumbersome and expensive process of detecting the antibodies that can help with the diagnosis of infectious and auto-immune diseases such as rheumatoid arthritis and HIV. For the future, the researchers plan to adapt their platform so that the signal of the nanoswitch may be read using a mobile phone, making their approach available to anyone. New research may revolutionize the slow, cumbersome and expensive process of detecting the antibodies that can help with the diagnosis of infectious and auto-immune diseases such as rheumatoid arthritis and HIV. An international team of researchers have designed and synthesized a nanometer-scale DNA “machine” whose customized modifications enable it to recognize a specific target antibody. Their new approach, which they described this month in Angewandte Chemie, promises to support the development of rapid, low-cost antibody detection at the point-of-care, eliminating the treatment initiation delays and increasing healthcare costs associated with current techniques. 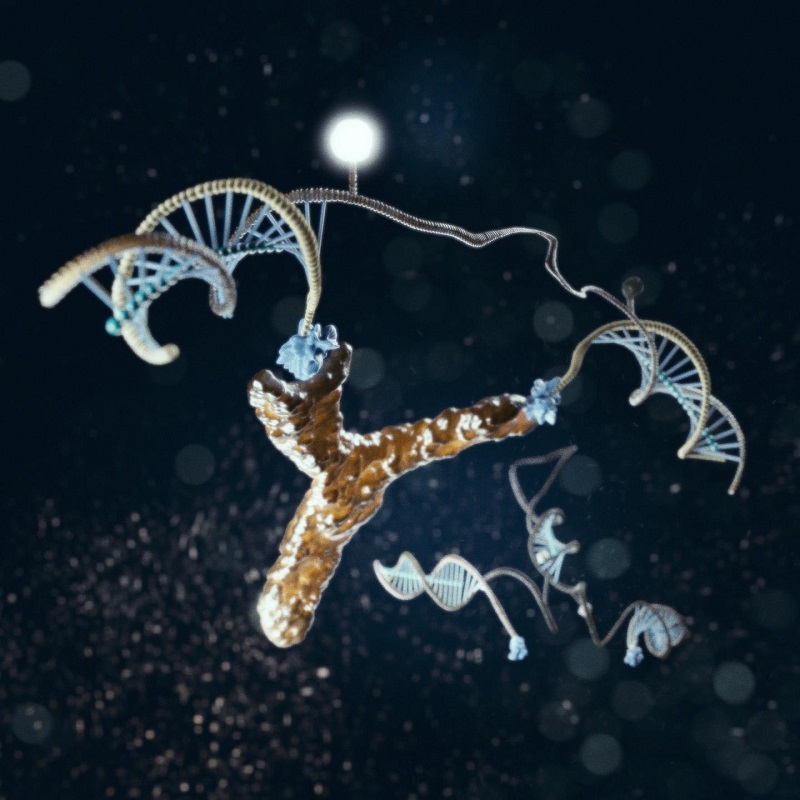 The light-generating DNA antibody detecting nanomachine is illustrated here in action, bound to an antibody. Credit: Marco Tripodi.